Director General of the Central Reserve Police Force Dilip Trivedi today said his men may have committed a mistake when they tried to defuse two improvised explosive devices, which exploded causing the death of three of them and injuring eight others in Bihar's Aurangabad district on Monday. "It can be said that there could have been a slight mistake or lapse in handling the IED, but it can be a human error. Even experts commit mistakes but it is important to see that our men went on a mission of national security and we should not be doubtful about someone who has sacrificed his life. When someone has seen a blast he could be disturbed. He is not careful about the timing and other things," said Trivedi on the sidelines of the CRPF's Valour Day held in Gurgaon today. The 11 security personnel were part of a 50-member strong CRPF contingent that also had a Station House Officer of the Bihar Police attached to it. The "acerbic" remarks of Samajwadi Party leader and Uttar Pradesh minister Azam Khan to propel his political prospects have outraged families of the Kargil War martyrs in Jammu and Kashmir. 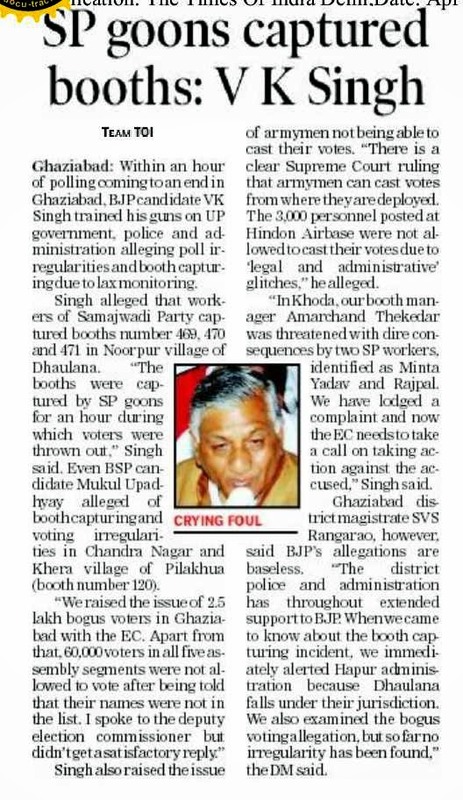 The SP leader had kicked up a political storm on Monday at Ghaziabad by reportedly saying India won the Kargil War solely because of Muslim soldiers and no Hindu soldier was behind the victory. “Only an insane person or the one, who wants to garner votes, can make such a statement about the Army and its soldiers. My uncle, Naik Dev Raj Sharma, was one among those who sacrificed their life in the war. The Army doesn’t differentiate in the name of caste, creed or religion,” said Vinod Sharma, Dev Raj’s nephew. Vinod, who runs a LPG refill agency allotted to Dev Raj’s wife Nirmala Devi, said: “Our Army is apolitical. The Indian Army has individuals from every community, religion and sect. How could he (Azam) be so irresponsible?” Every individual who fought the war was an Indian first and an Indian last. None should be let loose to talk rubbish just to propel his political prospects, he added. Sharda Bhau, wife of Daler Singh Bhau, a Havaldar from Pallanwala, said: “The soldiers who fought the war were Indians and not Muslims, Sikhs, Hindus or Christians. Soldier from every religion sacrificed their life in the war. Such leaders should be taken to task.” Sharda also runs a filling station at Domana on the outskirts of the city. My husband’s close friend Karim Abdul from 12 JAK LI was among the martyrs. Therefore, the SP leader should have though before opening his mouth, she added. Maj Gen (retd) GS Jamwal said: “Politicians should be educated by their parties because some issues are sacrosanct. The Army is not fighting elections.” General Jamwal said such statements hurt the morale of the soldiers. At least 69 soldiers from Jammu and Kashmir among 527 were martyred during the war. Jammu and Kashmir Chief Minister Omar Abdullah today said the Army should be kept out of the "murky world" of divisive communal politics. "Politicians like Azam Khan are well advised to refrain from dragging the Army into the murky world of divisive communal politics," Omar wrote on micro-blogging site Twitter. While reports that India’s first aircraft carrier, INS Vikrant, is to be sold off as scrap has stirred sentiments of many, there is a little-known story of how, at the height of its operational employability in the 1971 Indo-Pak war, limitations arising out of sanctions imposed by the US were overcome to ensure that the sea warrior went to war. INS Vikrant, that served the Indian Navy from March 1961 to June 1997, played a decisive role in the war and formed a vital part of Indian’s maritime legacy and military history. In June 1970, INS Vikrant was berthed for major repairs due to a crack in a water drum of one of the boilers that powered its steam catapult to launch aircraft. Unable to procure a replacement drum and spares from the United Kingdom due to US sanctions, the then Chief of Naval Staff, Admiral SM Nanda, ordered modifications and retrofitting that would divert steam from the carrier’s forward machinery to the steam catapult, bypassing the damaged boiler. This repair enabled INS Vikrant to launch both the Sea Hawks and the Breguet Alizé, though at the cost of some of its cruising power. In March 1971, the carrier was put through trials and the modifications turned out to be hugely rewarding, enabling INS Vikrant to undertake combat operations on the high seas. Its aircraft unleashed their full prowess on Chittagong, Khulna and Cox’s Bazar, destroying Pakistani assets and vessels and completely decimating any defensive capability there. After six days of unrelenting attacks, INS Vikrant’s air wing had ensured East Pakistan was fully contained from the sea. The IAF’s only IL-76 outfit, No 44 Squadron, marked its 53rd anniversary this week. The squadron was raised at Chandigarh on April 6, 1961. 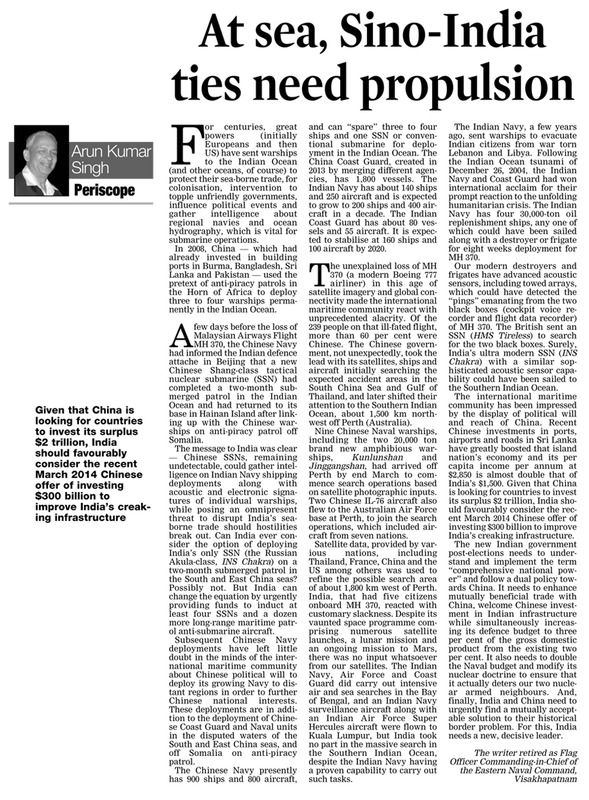 After a string of deployments elsewhere, it was relocated at Chandigarh a few years ago. Known as the Mighty Jets, the squadron is also the lifeline to the northern sector, airlifting men and material to the icy heights, besides undertaking strategic tasks and humanitarian missions at home and abroad. The squadron, raised on AN-12 turboprops, took the Chinese completely by surprise by airlifting AMX-13 tanks to Chushul, at an altitude of 14,000 feet, during the 1962 Sino-Indian conflict. During the 1971 Indo-Pak War, the squadron was involved in incessant bombing of Pakistani concentrations; and in 1988, it airlifted the Indian Para Brigade from Agra to the Maldives to thwart the coup attempt by mercenaries. Currently under the Command of Gp Capt VR Vishwanathan, the squadron set a new record when it used an IL-76 to airdrop paratroopers at Nyoma in Ladakh at 13,500 feet above sea level, which called for special skills due to rarefied air and mountainous terrain. On promotion this month, Air Marshal SRK Nair has taken over as the Senior Air Staff Officer (SASO) of the IAF’s Bangalore-based Training Command. A transport pilot who had earlier served as the Air Officer Commanding, 12 Wing, Chandigarh, he was closely involved in the planning and execution of reactivation of the world’s highest landing ground, Daulet Beg Oldie in Ladakh, by 48 Squadron from Chandigarh. He commanded 44 Squadron, then based at Nagpur, remained Assistant Chief of Air Staff, Operations (Transport and Helicopters) and was also associated with the induction of the C-17 Globemaster heavy light transport aircraft into the IAF. Very few officers from the transport stream have made it to the rank of air marshal. THERE is no reason to be neutral about the Musharraf trial. This trial is as much about Musharraf as it is about who possesses the power to alter the compact between the citizen and the state in Pakistan. The crisis of public morality and ethics in this country is caused not because we are too judgmental in public matters but because we are not. Our judgement is reserved for matters mostly private. Why should citizens, who bear allegiance to the Constitution, not have a view on the Musharraf trial? In the interest of disclosure, there is nothing neutral about what follows. Musharraf is rightly being tried for treason. If convicted, in accordance with due process, he must be made to serve his sentence. The prescribed punishment for treason is death or life imprisonment. As someone opposed to the death penalty, one would like to see Musharraf behind bars for life. Not because Musharraf is evil, but because what he did was unconstitutional and how we deal with him will shape the kind of country we want our kids to grow up in. None of the arguments made by Musharraf’s apologists support the view that Musharraf is innocent or deserves to be accorded preferential treatment. If you delve deeper there are essentially two arguments in his support. One, that Pakistanis are not fit for democracy. We deserve to be dealt with a stick and it is in our own interest to be subjected to ruthless authoritarianism. Thus there was nothing wrong with what Musharraf did. His flaw was that he wasn’t ruthless enough. And two, Musharraf’s trial is not about rule of law, constitutionalism or justice. It is about revenge. Sharif and the judges are meting out victor’s justice. But we are essentially an opportunistic and morally corrupt lot who will dance to the tune of whoever assumes power by any means, fair or foul. We lionised Ayub and Zia, and also Musharraf post-1999. And we are doing it again to please the new masters by beating up on a poor general whose chips are down. In other words, let’s continue being the sordid hypocritical lot that we are and let Musharraf slide as well. The predictions that Musharraf will be taken off the Exit Control List (ECL) and allowed to flee or else will be granted pardon by Sharif if convicted, are based on such appraisal of our leaders and nation. We seem comfortable with manifestations of elites being more equal than commoners. A former army chief who ruled this country for almost a decade, Musharraf is no ordinary man. So Pakistan’s universe — foreign friends, guardians of ‘ideological and territorial borders’, the ruling elite across institutions — will conspire to ensure that Musharraf is not reduced to a commoner. The remaining arguments are all in favour of holding others accountable instead of letting Musharraf off the hook. Can two wrongs make a right? If 1999 was the original sin, why not pressure the PML-N into holding those saboteurs of the Constitution accountable instead of asking it to let Musharraf be? Judges, who decided the Zafar Ali Shah case, wronged the Constitution when they eagerly handed over to Musharraf the authority to amend the Constitution, which they neither possessed nor was theirs to give. Can’t Musharraf call them as witnesses and argue that he was made to believe by judges themselves that the Constitution wasn’t something sacred that an all-powerful general couldn’t tinker with? If we have a chequered history of neither standing by the Constitution nor defending the principle of democracy, can’t we start now? If Musharraf or other army chiefs blundered in the past, must the present high command justify a wrongful past? If our judges and politicos were once complicit, must the present lot be stopped from treading a corrective path? “No one pretends that democracy is perfect or all-wise,” Churchill had famously said. The world settled for democracy after all other forms of government were tried and found wanting. If Zardaris and Sharifs are running a rotten show, shouldn’t we push to heal our state of democracy instead of justifying what Musharraf did? 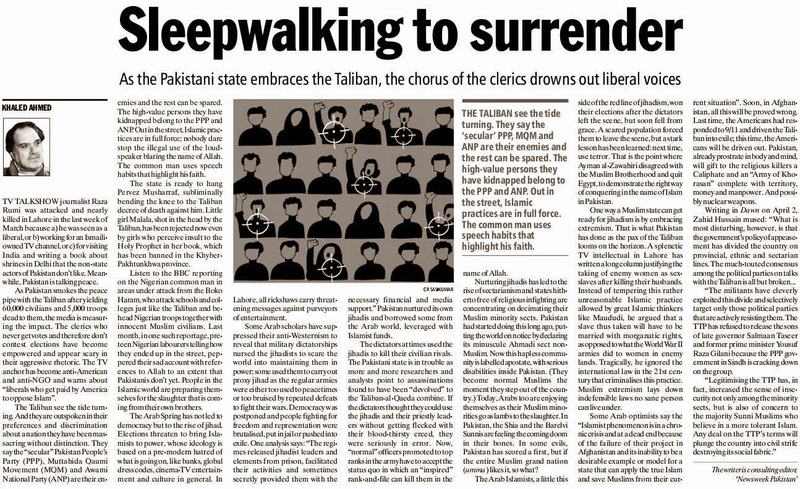 Opposition to the Musharraf trial is fuelled by Pakistan’s upper middle class’s veiled disdain for average Pakistanis, a lot it finds unfit for democracy and in need of being civilised by authoritarian messiahs. If Musharraf were an Allah Ditta and not a general no one in their right mind would even fathom the idea of letting him off the ECL. Those in support of his name being taken off are not arguing that he is not a flight risk, but that he should be enabled to flee in the ‘larger national interest’. Musharraf’s lawyers would need to be creative with legal arguments in a court to establish that keeping him on the ECL is an abuse of authority, especially after his established conduct of refusing to appear before the court willingly. In a world that isn’t made up of angels, ‘Let he who has not sinned cast the first stone’ is essentially a claim for impunity by the powerful. Do we not hear such moral objections in the hundreds of cases decided by courts each day? It is about time we begin developing a consensus in Pakistan that all authority must flow from the Constitution and anyone who refuses to profess allegiance to it is as much of a traitor as someone who refused to profess allegiance to kings in the age when men ruled, not law. Azam Khan, can you please spare the Indian Army from your communal politics? It is said that to win a general election, securing the state of Uttar Pradesh is a must. With over 180 million people, the existence of deep rooted social divisions based on caste, creed and religion, UP has been the playground for politicians to incite and agitate groups to practice vote-bank politics of the worst kind. The 2014 Lok Sabha elections are no different, and over the past few days, the fight for supremacy in Uttar Pradesh has been taken a few notches up, as expected. Analysts have said ‘fear’ is going to be the pivotal reason on how the state’s Muslim minorities vote, as many clerics and elders ask people to vote against the BJP which is looking to reverse India’s secular traits. The Samajwadi Party (SP) is taking these sentiments in its strides. One of the party’s main leaders, Azam Khan, has somehow even managed to add a communal twist to the Kargil war of 1999, which took place far away from the hinterland of UP amidst the peaks of the Himalayas in Kashmir. Khan has said “Muslim soldiers” were the reason behind India’s victory in the conflict. He also added that it was the Muslim faujis who raised the battlecry of God before conquering the peaks of Kargil. Khan’s comments come days after the BJP’s Amit Shah was caught asking a gathering to vote for ‘revenge’ in the upcoming polls. Shah also called SP leader Mulayam Singh ‘Mullah Mulayam’ and said the current, democratically elected SP government in UP will fall once Modi becomes prime minister. Both the Shahs and the Khans “working” within UP to gain more political mileage by pitching communities against each other have now managed to bring in the soldier in this pool of muck, a shrewd and unthoughtful political policy aimed at scare-mongering mostly poor people into giving votes to communal forces on the back of empty scare-tactics. 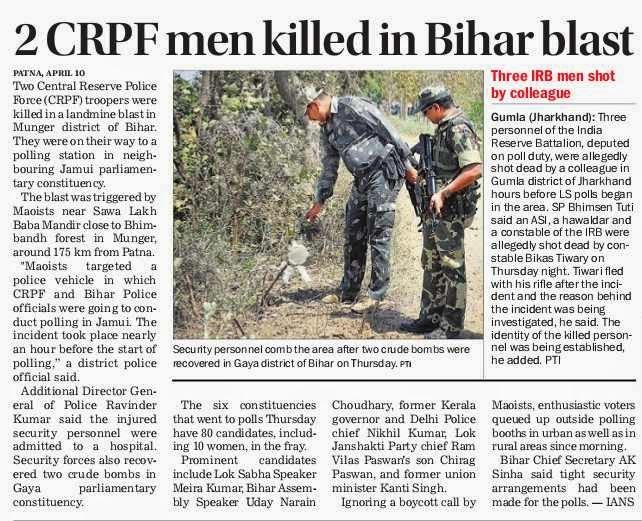 While Shah and Khan were busy adding new colours to their communal agendas, a few hundred kilometres from the political ground-zero of Uttar Pradesh in the state of Bihar, three jawans of the CRPF in Aurangabad district lost their lives while trying to defuse an explosive device with their bare hands. The device, believed to have been planted by Maoists, exploded, gravely injuring all three, who then found themselves in a region without adequate medical or evacuation facilities. When such apathy against the very people who risk their lives to maintain the security of the country could not find one reasonable political voice supporting them, people like Azam Khan are given free access by their own party leaderships to undercut political opponents using whatever means possible. 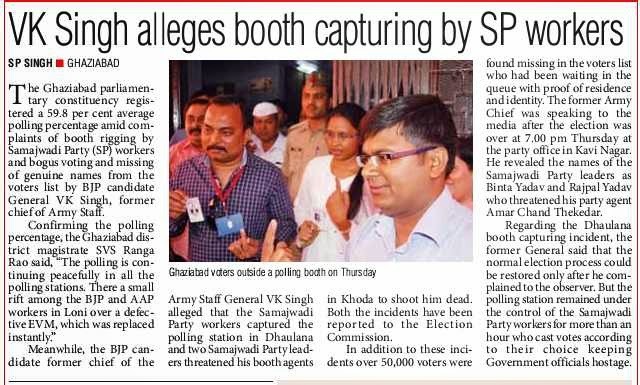 This continuous practice has gone unchallenged by legalities or more stringent checks by the Election Commission as well, and the success of such a ‘strategic-communal’ policy applied by the likes of the SP and the BJP are already reflecting in pre-poll surveys, giving more legitimacy to their effectiveness. For example, according to media reports, UP’s Muslim population may vote for the SP, the BSP and the Congress in order to try and keep the BJP out of the picture. Army on Monday successfully test fired an advanced version of 290 km range supersonic cruise missile BrahMos as part of a user trial at Pokhran test range in Rajasthan. The missile was launched by a mobile autonomous launcher deployed in full configuration with mobile command post at the ranges. "The launch was successful and the missile hit the designated target," Defence Spokesperson Col S D Goswami told. Senior Army officials witnessed the launch and congratulated the operational team for its successful launch. Both the Army and Navy have already inducted the missile, developed by India in partnership with Russia.